Colin is a teenage werewolf. He's constantly hungry and needs to learn how to control his wolf side, which isn't always easy. Fortunately he has Becca, his witch and necromancer girlfriend. She knows exactly what it's like to be a teenager with abilities. Colin is living in Elkwood, where there are all kinds of different creatures, like vampires, krakens, ogres and more. Colin's working for an organization that helps to keep them in check and protect the human citizens of Elkwood. When a mission goes wrong Colin has some explaining to do, but was it really his fault? Weird things are happening in Elkwood. Colin is used to a grandma who controls the weather, magic and hanging out with other werewolves, but this is different. Elkwood needs Colin to fix the problem, will he be able to do it, even though he's still young and hasn't been a werewolf all that long? Who can he count on for help and will he manage to come up with a plan that works? 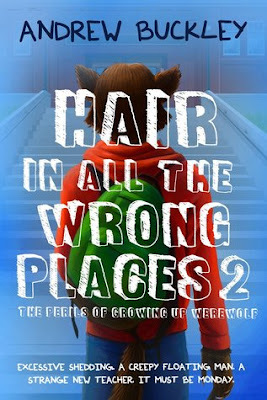 Hair in All the Wrong Places 2 (The Perils of Growing Up Werewolf) is a fantastic gripping story. Colin is kindhearted and caring. He can be dangerous when he's in wolf form, but he's also just a regular teenager. I loved these two different sides of his character. He's very much in love, he likes spending time with his girlfriend Becca, he's a good friend, stands up to bullies and he loves food. I liked how he remains so normal, while he's also strong, smart and resilient and takes being a wolf seriously. He's a fantastic hero and I enjoyed reading about his adventures. I couldn't wait to read another story set in Elkwood, it's such a fascinating fictional town. It was fun to read more about the different inhabitants and their abilities. There's such a great variety of supernatural characters and they're all fabulous. 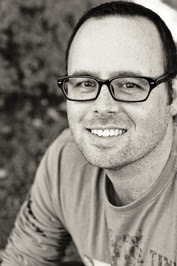 Andew Buckley's tone of voice is filled with sympathy and he has a catchy sense of humor that always makes me smile. Hair in All the Wrong Places 2 (The Perils of Growing Up Werewolf) is just as good as the first book in the series, Hair in All the Wrong Places. The stories are dynamic, entertaining, captivating and clever. I love this series and highly recommend it. If you love reading werewolf stories Hair in All the Wrong Places 2 (The Perils of Growing Up Werewolf) is an excellent choice. The books are meant for children between 9 and 12 years old, but are suitable for adults as well. My advice is to start with Hair in All the Wrong Places, the books are easier to understand if you read them in their correct order. There are a few reasons as to why I decided to write a werewolf series, in particular one for a middle grade audience. Firstly, the target demographic – My kids are of an age where they’re starting to read chapter books and I wanted to write something that they could read. Up until this point I’d written nothing but adult-themed novels and HIATWP and its sequel represents my first foray into MG fiction. As for the inspiration for the original story . . . I’d always wanted to write a werewolf novel because I’ve been fascinated with the hairy creatures of the night since I first saw the Wolfman in ‘The Monster Squad’. Michael J Fox’s ‘Teen Wolf’ made the creatures even cooler in my eyes (c’mon, he played basketball and got the hot girl). From there it was several skips and jumps across movies such as ‘Abbott and Costello Meet the Wolfman’ and Jack Nicholson’s ‘Wolf’, ‘A Werewolf in London’, and many more. It was those movies and the representations of werewolves whether they were the hero or the villain that made me want to write a werewolf story. And HIATWP isn’t my first foray into werewolves. In 1995 I made the decision to become a screenwriter. My first screenplay was titled ‘Wolfsbane’ and followed a group of werewolves as they infiltrated a government base to save members of their own kind. It was silly and action packed and riddled with cliché’s. One of my adult novels, a fairy tale adventure titled ‘Stiltskin’ also featured a werewolf in a prominent role. Sounds really great. A book that I'll be definetly recomending to my daughter. Elkwood sounds like a great town that I'd like to read more of. I haven't heard of Abbott & Costello's Wolfman in years! I shall have to go Googling! Love Werewolf stories. Great guest post.